Hey guys just about to replace the inverter on my 2007 sebring dash cluster. All 12 volt inverters we carry are good for car instrument panel lighting. If you know amperage of power source or know how to reduce amperage, choose A6 inverter for your project. If not so sure, purchase A5 inverter which can take up to 3A current. Which one should I buy do you guys think? Thanks a lot, I appreciate any help. For Sebring model build after 2008 the inverter is right on the Instrument cluster's PCB. So an inverter brick will not fit in. The electronic board PCB is the same for Caliber(2007-2010), Sebring (2008 - present) and Avenger (2008 - 2010) models that use EL foil as back-light. It uses a single specialized QFN16 IC that fail and even if this IC is replaced with new one, it will continue to fail due lowered impedance of electroluminescent foil (aged). So the add-on inverter has to be placed inside the dashboard and connected through six wires. In this way the dimming and ON/OFF functions will work in exactly the same way as original one. Hey I'm sorry to hear that about your dashboard lights. I hope that it gets fixed soon. There is nowhere that I could possible install this part I ordered from Glowhut. Did I order the wrong part? Should I have ordered this Card version this poster installed in his Dodge? Maybe the thermostat and fuel gauges both not being lit are a result of burnt bulbs but honestly 90% of the time the speedodometer is just flashing and flickers off and on. Look closely and you can see the RPM meter is also not consistantly lit. Actually, this picture is probably not showing the problem well enough sorry. In reality, I cannot see how fast I'm going without my GPS. Any help would be greatly appreciated. Maybe I should go grab some replacement bulbs and eliminate that but at this point don't want to start mail order parts again without being sure exactly what I am ordering and why. Seems I already made that mistake and perhaps didn't read threads clearly enough? Start with the bulbs. One would think that if it were the inverter, it would affect all the bulbs, not just some of them. Thanks for the reply, I will look at the bulbs next for sure. However, this is what I meant though about that front view picture maybe being too good (indicating a false positive if you will), imagine that the speedodometer is only lighting up 30%, then suddenly the face is up to 50% lit, Also the red glowing long arm or pointer that actually indicates the speed stops glowing completely, and then comes back on but is flickering, etc. Also, usually the RPM gauge is not lit almost 100% as shown ihe picture. Only part of it is lit. Also, the thermostate gauge didn't fail like blown bulb, it kinda of faded away over time, like a flash light running out of batteries. So one would think that if a light bulb is to blame, like for example RPM gauge would not suddenly come back online when it wants to. Just like a bulb in your home, it either works or it doesn't that is unless the problem is something other than the bulb. Edited October 21st 2014: I have an instrument cluster different than ones in the linked youtube video, and also different than any online tutorials on Sebringcontertible club that I have seen. My car is 2004 Sebring LE sedan. Originally registered in 7/2003, one of the first Sebrings with the front end facelift and also maybe when they started using an instrument cluster without any of the Inverters mentioned in this post. Last edited by markkuarimo; 10-21-2014 at 04:49 AM. Reason: edited for accuracy due to new knowledge flowing in by user MOc. My ELD5 inverter card (six wires) is for 2007-2009 Chrysler Sebring and 2006-2009 Dodge Caliber (also Avenger) and is the only inverter that works in those cars. In your case sience your car is from 2004 you bouth the right part if it have 4 wire. First of all forget about light bulbs, those light bulbs are for turn signals, check engine light and other . The backlight is not comming from that light bulbs. Now, to access the inverter you have to unscrew the screws and carefully but firmly pull the PCB (electronic board) out. The dial gauges have male-female connectors that mate directly on PCB. 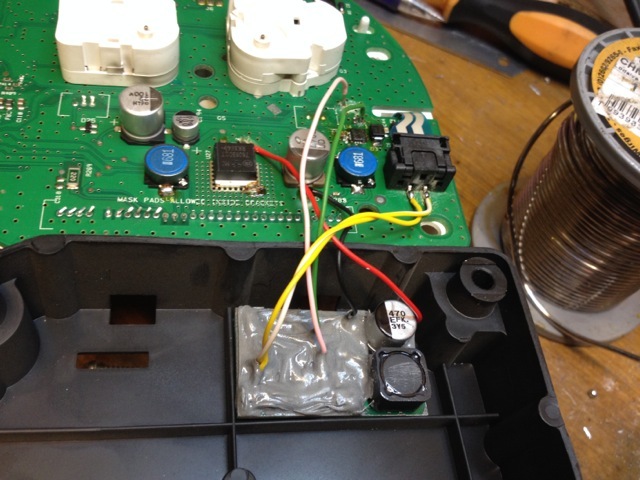 After you remove the PCB you will see a small black box with 4 wires.That's the inverter that you should replace. Unscrew the 2 screws that fix the old inverter and connect the new one. On one side the black wire is negative (-) and the other side you will have the 2 wires that goes to the EL foil. Thanks for the help. 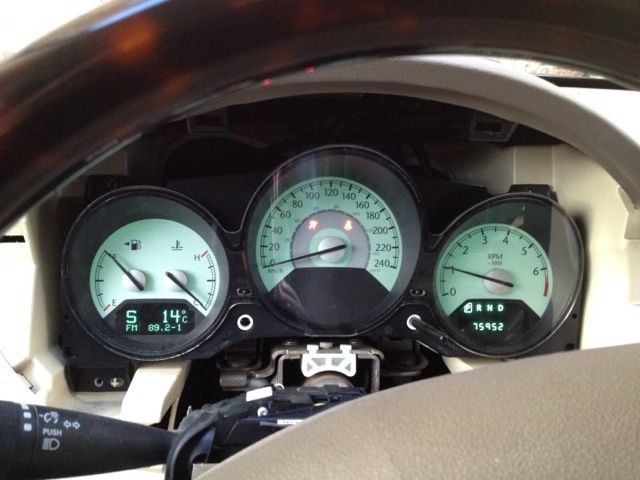 However, there is not a black box in my instrument cluster. Look and see for yourself. (the pictures I posted earlier in this thread confirm it is not fixed to the PCB before anyone suggests that it is somewhere else I forgot to look. This is the second time I pulled the instrument cluster and I pulled it specifically before replying here to make sure my eyes weren't playing tricks on me. Ohh, see now, you have the plastic prisms illumination version. Those transparent plastic pieces perpendicular on the back of your cluster "conduct" the light and diffuse it all over the front surface. You are lucky ! Just check the lamps marked as "LP x ILLUM" with the white paint ! You can be cleared identified the fault ones when you compare them against your dark points and the plastic prism. Also the contacts, traces and sockets, those sockets had took a lot of heat as backlite illumination was used more often than any other bulbs there. If you find all good, exchange one that you know is working with the one that is playing tricks and see if failure move also. Good luck ! Last edited by MOc; 10-20-2014 at 04:11 PM.